Are you surviving or thriving? Could your life become more fulfilling? Does any part of your life seem overwhelming? A major issue facing people today is how to balance their personal and professional lives. According to a survey of U.S. workers, their number one job priority is balancing work and personal responsibilities. We find ourselves torn between the two and often times the job wins and the more unbalanced our live seem to become. When we are out of balance we feel stress. We spend more time reacting to events rather than taking charge of them. We loose the ability to be proactive and are forced to address things reactively. We fall into unproductive habits that may undermine our confidence and self-esteem. We lose sight of what’s important and we become unable to do what’s most important because we are overwhelmed with other things that “need” to be done. On the other hand, people whose lives are balanced focus on possibilities and opportunity rather than problems and pitfalls. They live lives of passion and purpose rather than fear, frustration and stress. They set boundaries to ensure that they spend their time doing what is most important. 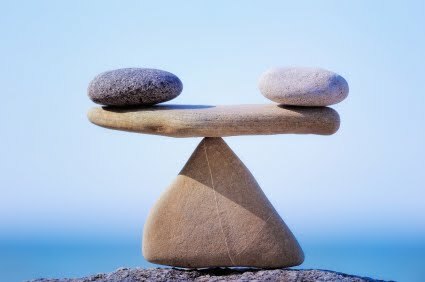 Self-Assessment Exercise: Is your Life Balanced? On a scale of 1 to 10, with 1 being totally unsatisfied and 10 being totally satisfied, rank how satisfied you are with the following areas of your life. In the box, write a brief description of this area as it is now. List three priority areas you want to work on with the highest priority listed as number one. How would each area have to change to improve its rating by two points? Here is an example: One of John’s three priority areas is Money Matters. He has a current Money Matter score of 3 and he owes more than $15,000 on his credit cards and only has $2,000 in savings. In order to move his score from 3 to 5 he decides he needs to pay off 40% of his credit card debt and double his savings. What is your number one priority? Write it here and create three SMART goals to help you achieve it. A SMART goal is: Specific, Measurable, Achievable, Realistic, Time allocation is appropriate. Stop using credit cards immediately and start paying cash. Create and stick to a budget within thirty days from today. Limit lunch and dinner out to once a month starting now.